A Birmingham artist has been chosen to front a new campaign aimed at boosting business start ups among young people. Alexander Rhys Boardman is leading the #YouAreTheNext campaign alongside youth charity The Prince&apos;s Trust and bank NatWest. The new initiative is aimed at encouraging young people to believe in their ideas and set up in business. Mr Boardman, who suffers from anxiety and obsessive compulsive disorder (OCD), had previously worked with the charity through its enterprise programme at a time in his life when he said he felt lost and lacking direction. The programme works with 18 to 30 year olds to turn their ideas into business reality. 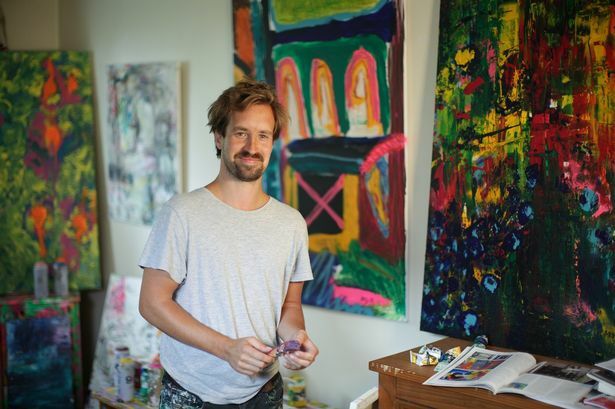 After launching his own business, he is now selling his art worldwide and his work is currently on show at the Saatchi Gallery in London with upcoming exhibitions in the UK and Portugal and a new book out soon. He has taken part in a new film to promote the #YouAreTheNext campaign. Mr Boardman said: "I was lacking direction and felt completely lost before I came to The Prince&apos;s Trust. "I suffer from OCD and anxiety which means I can find it difficult to cope with everyday life. "Because of my OCD, I see things in a linear, structured way which actually helps me to create really strong visual images. "I was able to find a creative outlet where my OCD could actually be turned into a positive. "Painting has always been a way to express myself and I knew I had talent but until I came to The Prince&apos;s Trust I didn&apos;t know how to start a business or make a living from my art. "I didn&apos;t even know if it was for people like me. "I&apos;d never had people believe in me before and, on top of that, the Prince&apos;s Trust taught me so much. "To think I now have my own business is incredible." Gordon Merrylees, managing director of entrepreneurship at NatWest, added: "For the last 18 years, we have worked in partnership with The Prince&apos;s Trust to create an environment that encourages and enables young people to develop their talents and ideas into sustainable businesses. "Time and time again we see the transformative impact of someone believing in your idea and providing the necessary support systems to validate it, test it and develop it into a reality and into a career. "Self-employment is an empowering opportunity for young people as, whatever their background, they can carve out a new life for themselves by doing something they love and are great at, the world needs it and it can make a difference to people&apos;s lives."